However, we are going to plugin a ‘control’ table in order for us to test the alert by artificially adjusting the results. Including the Metric Extension name in the query allows us to use this table for multiple Metric Extensions on the same database. As the source table is usually empty it would be difficult to test the ME is working but now we can simply update the value in em_me_control as we please to create a warning, critical and clear. Ensure “Manually Clearable Alert” is false as this is misleading and it means the alert doesn’t auto clear. Note: in the alert/clear message you can use the variables %keyValue%, %value% and %columnName% to add specific values to the message e.g. Integration Table has 318 rows in the table. In this scenario we aren’t particularly concerned with the exact number of rows, just that there are a number of rows present so we’ve used a generic message. If monitoring credentials are already setup then use those. Deploy the ME to the required databases (including any standby databases). First make it a Deployable Draft. Over time the data will show this table having little or no data in it but for now we will test the control table is working. The collection is every five mins so the next collection will show the new value of at least 6 (6 artificial plus any genuine rows in the table at the time of execution). It should also generate a warning. From the above graph we can see that the data collection has been working overnight. The last Collection Timestamp is within the last 5 mins. As expected, due to the nature of the table the High Value is only 2. This is not enough to trigger any form of alert. In the past we would have gone into Metric and Collection Settings and manually adjusted the thresholds temporarily in order to force an alert to be produced e.g. Warning 0 and Critical 1. For this metric this is possible with the only risk being the thresholds being left incorrectly set. However, if our Comparison Operator was an “=” rather than a “>” then that could be problematic. The “control” table makes this really easy. To test a warning and critical alert we can now adjust the table. After the next scheduled collection we can now see the the warning alert has been triggered. 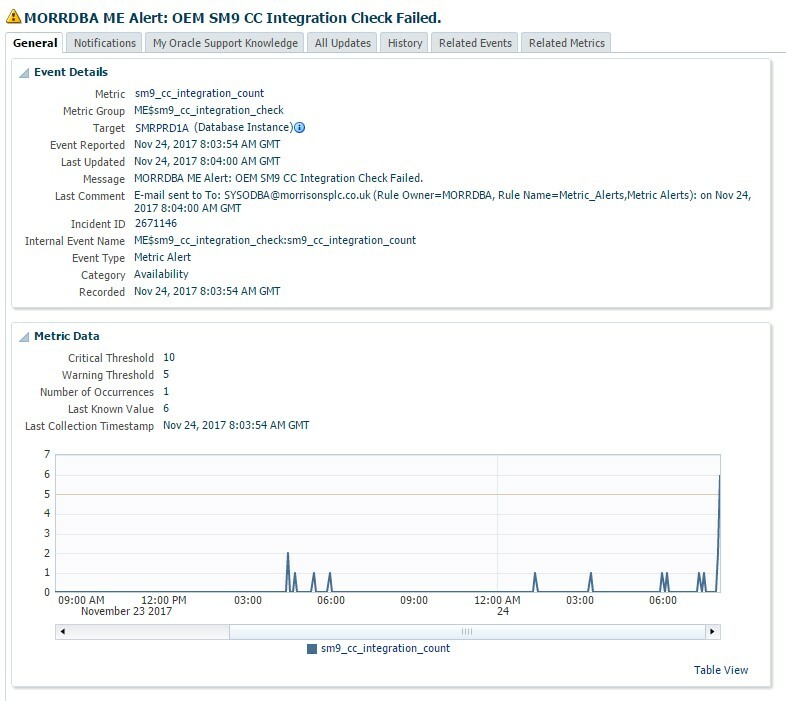 We have standard notification rules setup so this alert was sent to our HP OMI Tool automatically. You can see this under “Last Comment” as that scripts sends the alert to OMI for processing. Now we can make this a critical by increasing the value to 11. Now we need to both clear the alert and return the metric to it’s correct state for future monitoring. 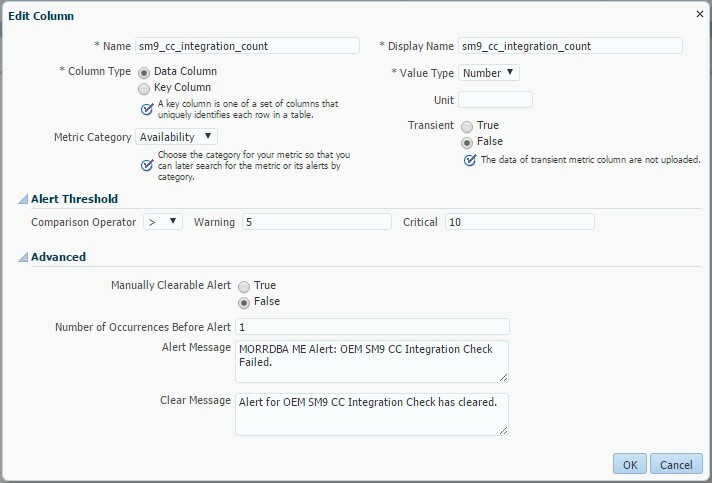 If we specifically look at the Metric Alert History we can see a summary of what we’ve tested based on just adjusting the metric control table. This entry was posted on November 27, 2017 at 10:12 am	and is filed under Oracle. Tagged: metric extension, OEm, OMI, udm. You can follow any responses to this entry through the RSS 2.0 feed. You can leave a response, or trackback from your own site.